This is a very short "boss fight" created in one week as a solo project at the Entertainment Technology Center. 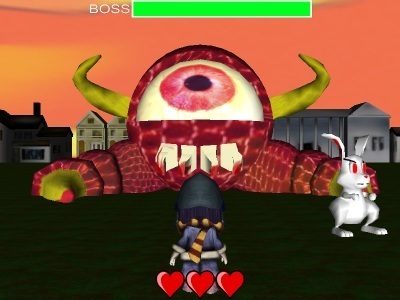 The objective of the game is to defeat a giant eyeball monster by capturing exploding bunnies and sending them hopping towards the eyeball monster. The gameplay is similar to a Zelda boss fight in that it's somewhat of a puzzle to figure out how to defeat the boss. There are two different endings to the game depending on whether you defeat the boss or are killed. It is fun for a play-through or two. Once downloaded (and Panda3D is installed), extract edbvtem.zip and run the runWorld.bat file.